A protest has been organized on September 28 in Bamako by the patriotic organization coordinators demanding the releases of Malian weapons blocked in ports in the sub-region of West Africa. These groups of Malian did not agree with the military intervention of ECOWAS to regain the Northern part of Mali. 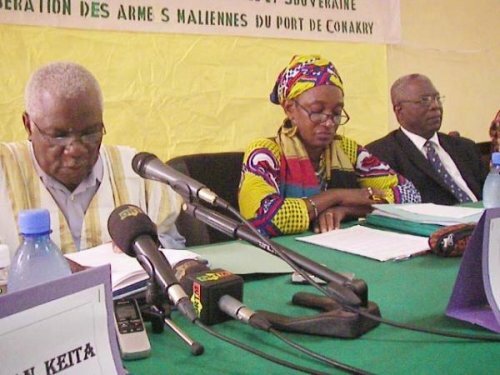 The agreement carried out between the transitional authorities in Mali and the Economic Community of West Africa States (ECOWAS) for a military deployment in Bamako is not that of the patriotic organizations in Mali (Copam).To show how disgruntle they were against the arrival of foreign troops on the Malian soil, hundred of people demonstrated in the Malian capital, calling on a favorable organization. Through slogans like "Down with ECOWAS", "Blaise Compaoré low", "low Yayi Boni," "low Alassane Ouattara",the various supporters wanted to show to the public how bad they feel about a military intervention taking over the territories of northern Mali which has been occupied by the army for more than six months now. According to Younouss Hamèye Dicko, president of the patriotic organizations Coordination in Mali, the walk is out to support the Malian army who can liberate the territories of the north Mali. But listening to officials of Copam the supporters instead have to provide logistical support and reinforcements to the Malian army. In order for this to be realized, the protesters demanded the release of weapons locked in several ports of West Africa including the port of Conakry. The president of this movement, Malick Alhousseini welcomes international mobilization to the release of four administrative regions, Gao, Timbuktu, Kidal and Douentza, controlled by the Islamists affiliated with al-Qaeda in the Islamic Maghreb (AQIM). Coren also honors the determination of the political and military authorities of Mali who facilitated this international mobilization and urges them to do everything within their power for the rapid release of Northern Mali.